Probably just an error. There are many if you look carefully. Once I saw one of Luffy's hands have only four fingers. The ankle scarring you see is on the left leg, which is not completely visible because of the clouds in the bottom image. Probably that's why we can't see it. 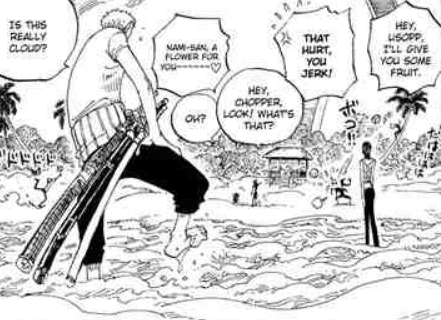 As per chapter-122 Page-20, we see that the sword on the left leg is blooded, so not sure whether the right leg was also scarred at that moment. Asking a ninja to hide in the ceiling and get pierced by a spear? Why is it when a character nimbly dodges attacks the aggressor will call it “running away”?